Oh how I love a chesterfield sofa. They work in so many different styles of decor and they provide such a strong element of style wherever they are placed. So, yesterday, I was wandering around Homegoods (one of my favorite hobbies) when I came upon this beauty. I practically threw myself on top of it and claimed it as mine, but then I remembered that I have absolutely nowhere to place it. Sigh. I was so sad to walk away from such an amazing deal. 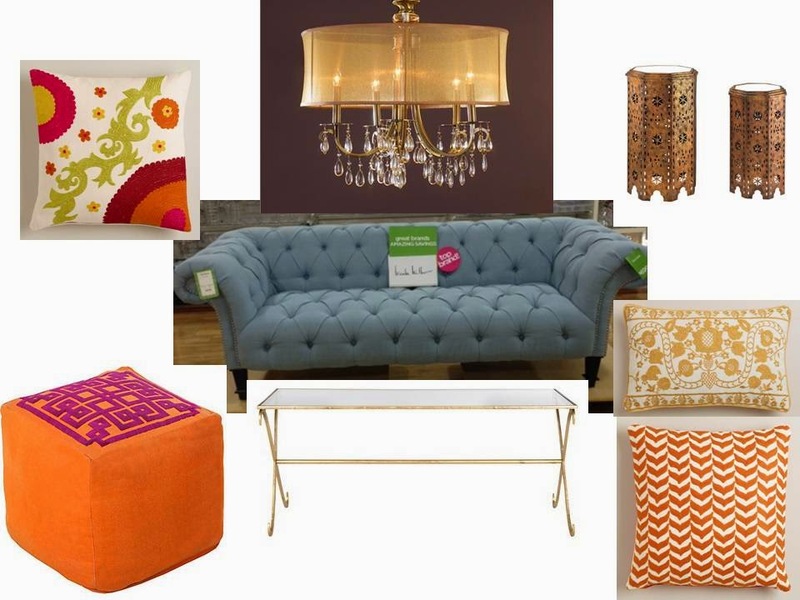 So then I started thinking about how I would style such a fantastic sofa. As I mentioned before, a chesterfield sofa can be used in just about any style of decor and there are so many different ways my imagination can go with this one. I started picturing it with fun and funky colorful bohemian accents; something really girly and lighthearted. This is such a departure from my usual style, that it is refreshing to play this way. Here is my girly bohemian take on this chesterfield. Let me know what you think! Also, let me know if you would like to see it styled in a different way. Love all of those pieces especially that sofa looks comfortable.